Thanks for the replies so far, all pretty much saying what I hoped, I'm booking a test ride next Thursday. Having driven the XRx low and owning an XCa I would seriously consider the "low" if you are 5'10" or less but still consider it up to 6ft. The bike is a heavy lump, especially top end and you feel it at slow speed and manoeuvring. I also feel the XRx is much better value than the XRt so no loss by going for the low model. There is no centre stand on the low but with shaft drive it is not too much of an inconvenience I'm sure. I am 6ft and have lowered my XCa 20mm and I'm glad I did (I do have a bit of a dicky back though). As for the rest of the bike, just magic. 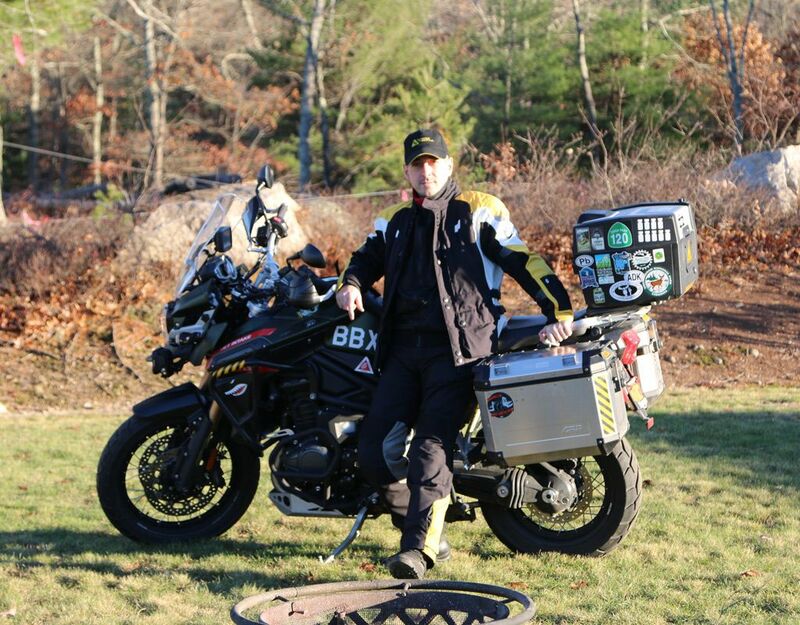 When I was shopping around for an adventure bike, I always had long range and reliability in mind - get on the bike and go for thousands of miles and don't worry about anything. KTM Adventure was on my list and I dropped it because almost every single Ride Report I read / followed if it had a KTM in it, at one point the KTM's guts were on the ground somewhere and the rider was fixing it. It was funny - almost every single one of them. Eventually in the middle of the ride, the KTM needed some work done on it. Triumph on the other hand - I am on my third TEX - never let me down. Even when the right fork seal was busted after the Trans Labrador trip in Quebec I kept riding it. In fact, I rode from Quebec all the way down to Providence in one shot, under heavy rain, with the bike loaded up like a gypsy bus. Power delivery: if I don't pay attention I'd wheelie when I sneeze. the first time I rode that bike from the dealership to home I almost broke my neck when I tried to catch the yellow light. I had no idea about the power delivery. Inline triple is something else. You are not getting old, you are getting wiser. Shaft drive is a dream. Will you miss your KTM? Probably every once in a while - it's one hell of a motorcycle and I am sure there are aspects of it that TEX won't match. And more than likely, vice-versa. Hi Willy, I very nearly bought and 1190 just before my first Explorer. I remember taking it out on test from Teasdales and immediately thought, 'what a stonking bike' about and hour later I stopped for a cuppa, had a big grin on my face, but realised I was absolutely knackered. The 1190 was a cracking piece of kit but just a little to focused for my ageing body and brain. Yes you'll miss that sheer raw power of the KTM from time to time but all the Explorers are cracking bikes, although I must say I think the Gen3 has the edge on the previous models. I'm not a million miles away from you, just down the road in Beverley. Not sure where you're going for your test, but Team Roberts in Conisburgh just outside Doncaster, in my experience, are much nicer to deal with than A1 in York. Not sure where you're going for your test, but Team Roberts in Conisburgh just outside Doncaster, in my experience, are much nicer to deal with than A1 in York. I did a lot of research on this subject and went with the Triumph. While the KTM has more of a race edge and feel, there is more maintenance it seems with them. The KTM is the kind of bike that won't leave you stranded but you are going to be wrenching on it more to fix the smaller things. The Triumph just runs. (sure there are exceptions to all bikes but in my experience and research in general, I have owned both brands) It also doesn't seem to lose out, I think, in the real world on the pavement, dirt I would give an edge to the KTM. Sometimes the dyno does lie because it only gives you one aspect of the picture. I don't want you to think that the Triumph is boring or the Honda Accord of the bike world, I think you would be trading the slight edge for a little less work and that was the perfect mix for me. I liked how Triumph had a 2 year unlimited warranty, most of the KTM bikes are 1 year and I *THINK* 12K miles (there are a couple of KTMs that do get the 2 year warranty I just don't remember which ones off of the top of my head). KTM, lighter, faster, more capable off road. TEX, more comfortable, better looking- my opinion, less maitenance, better for two up. The choice is yours, after a good ride you will know. So how was you test ride? I almost went with the KTM as well but glad I didn’t. The dealership in my town is, well, let’s just say less than what they could be. Dealer support is important to me. My first choice was to stay with Ducati but the nearest dealership was 100+ miles away. The MultiStrada is an incredible bike. Chain maintenance doesn’t bother me in the least. I haven’t ridden the GenIII Tiger so I can’t chime in on that. My ‘15 was bought new about a year ago....I couldn’t pass on the fantastic deal I got. Between heavy discount off MSRP, rebate, free explorer hard panniers and zero percent financing it was a no brainer.